A Christianity of heightened spiritual experience came early to colonial Crosswicks in the “Inner Light” mysticism of its Quaker settlers and the “Great Awakening” Calvinism of David Brainerd’s mission to the Lenape. Yet, it was not until March of 1772 that the Wesleyan dynamic of “the heart strangely warmed” arrived in the person of the traveling Methodist lay-preacher Francis Asbury. Only 9 months before, he had been commissioned in England for service in America by John Wesley, the Anglican priest and Oxford professor, whose ardent faith and unconventional ministry had launched the evangelical reform movement known as Methodism. En route from New York to Philadelphia, Asbury left a record in his Journal: “I set off on a rough-gaited horse for Burlington and, being much shaken, breakfasted at Spotswood, fed my horse again at Crosswicks, and then thought to push on to Burlington, but the roads being very bad and myself and my horse weary, I lodged with a Quaker on whom I called to inquire the way. He not only invited me to tarry all night, but also treated me with great kindness.” Later visits resulted in “the wife of Brother Hancock” becoming, in 1774, the first village resident to experience a “new-birth” conversion under Asbury’s preaching. From 1775, itinerants on the vast “Trenton Circuit” (with stops in today’s Mercer, Burlington, Ocean and Monmouth counties) preached regularly at Crosswicks, in homes and outside. First came William Duke, a brilliant, young, future professor, whose Greek New Testament was a gift from his language tutor, the famed preacher and retired soldier Captain Thomas Webb, living near Burlington. 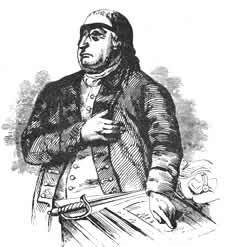 A pillar of Colonial Methodism, the colorful Webb, whose eye-patch hid a war-wound, often proclaimed the gospel clad in his regimental uniform with his sword lain across an open Bible. When hostilities began in 1776, Webb himself rode the circuit until, in 1777, he and his family were interned as British loyalists and repatriated to England the following year. Ratified in 1784, the Peace Treaty of Paris finalized America’s break with England. At a Christmas Conference in Baltimore, that year, American Methodism became with John Wesley’s blessing an ecclesiastical body apart from the Church of England, with the newly ordained Asbury as one of two bishops. 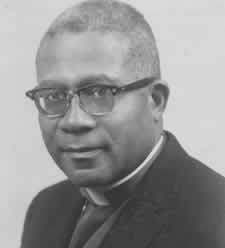 Present at this conference was the visionary preacher Richard Allen, who later founded a sister denomination, the African Methodist Episcopal Church. Present too was a future minister of Crosswicks, Ezekiel Cooper, who rode the Trenton Circuit in 1787, later served St. George’s in Philadelphia and, in 1800, assumed the important work of “superintendent” for the Methodist Press. Something of an institution, Cooper was reputedly “the oldest Methodist preacher in the world” when he died at 84. Heirs to Anglican doctrine and liturgy, the Methodists of Crosswicks lacked a building of their own suitable to both Word and Sacrament. Thus, on September 3, 1789, “Jeremiah Smith and his wife of Philadelphia” conveyed to them “a piece of ground on the north side of the road leading to Waln’s Mill, in trust for the Methodist Episcopal Church . . . upon which to erect a meeting place.” The trustees of record were Bishops Coke and Asbury; James Sterling and George Smith of Burlington; William and Isaac Budd of Southampton; and Samuel Lovell, Joseph Meirs and John Lovell of Crosswicks. Built in 1790, this first “Meeting House” stood for nearly 40 years before a fire destroyed it. Bishop Asbury spoke there repeatedly and, in his Journal, praised the hospitality of the local people. A new structure was erected in 1830, but in time was outgrown and, after 53 years, it was torn down. (The open space at the southeast corner of the old Methodist Cemetery on Crosswicks-Ellisdale Road still marks the site of the first two buildings.) As Methodism grew, a “Crosswicks-circuit” was formed in 1832 and functioned for some time, with the resident minister of the Village serving several country congregations. In 1851, the energetic wife of Pastor Townsend began a Sunday school at what is now Ellisdale, which soon led to revival services and, in 1852, to the erecting of a church. Today, as then, the Methodist Churches of Crosswicks and Ellisdale share in pastoral ministry. After the Civil War, Methodism developed locally, first, with the founding of Grace African Methodist Episcopal Church and, then, with the relocation in 1884 of the original Methodist body to a spacious new structure built at the centrally located corner of Church Street and Ward Avenue. After more than a century of interior alterations, restoration-work on this building in 2002 (aided by a grant from “The Brick Foundation”) revealed that the southern foundational wall consisted of local fieldstone set within brick masonry. These stones were undoubtedly salvaged from the foundation of the first two buildings – a lovely feature that has been left exposed to view as a palpable reminder of a long heritage of faith. 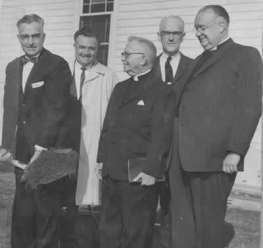 In 1964, an educational and fellowship wing was built, which was consecrated in May of 1965 by Bishop Prince A. Taylor, the first Afro-American leader of New Jersey’s main Methodist body. Other improvements to the physical plant have been made over the years, but always with an eye to advancing Christian ministry. Today, the United Methodist Church of Crosswicks seeks, as Asbury did over 230 years ago, to proclaim the experience of God’s saving love in Christ Jesus to the Village and beyond.